If you asked most people when St. Patrick’s Day is I would hazard a guess that most could answer correctly. Of course, when it comes to St Patrick’s Day, the Irish and those of Irish heritage, are not shy in coming forward in the celebrations. I was known to sport green clothes, at the very least accessories, to school and come home to a mound of green dyed mashed potatoes on my plate. I can recall no such special treatment to my potatoes on St. George's Day. No mound of red to come home to. This is despite the fact that as well as my Irish heritage, I have some English too. No Kiss Me I’m English badge worn on St George’s Day. Nope, this occasion more or less slipped by unnoticed, but I do recall a teacher from England, in primary school, once mentioning it. However, with no party or parade, we were unimpressed. Well, here we are and the day is upon us again. So, who is St George and how did he get the honour of becoming England’s patron? St. George was born in Turkey and became a Roman soldier who fought Rome’s persecution against Christians. He was held prisoner and tortured for his trouble and eventually beheaded in Palestine. Despite all, he remained true to his faith. His distinct emblem of the thick red cross on a white background was adopted by Richard the Lionheart, with the King’s soldiers wearing it in battle in order the help identify the troops. It then became part of the British flag. The dragon was an image often used to represent the devil. In the twelfth century, hundreds of years after his death, the folklore began surrounding St. George and his dragon slaying prowess. The legend goes that a town being terrorised by a dragon decided to appease it with the offer of a young princess and George upon hearing this news rode into the village and promptly slayed the dragon and rescued the young princess. Sadly, it is unlikely that the real St. George was ever on British soil and thus his dragon slaying abilities would not have been witnessed here. 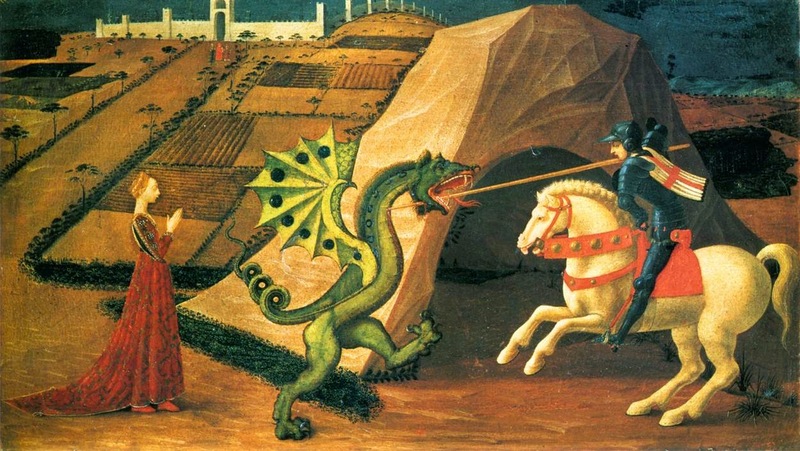 The real story of St. George is one of battles fought against Christian oppressors and, as such, in 1222 the Council of Oxford declared April 23 to be known as St. Georges Day. Today his bravery and valour still have note with, for example, The George Cross being the highest award a civilian can receive, followed by the George Medal. Only the truly brave and inspiring will ever be honoured in such a way. There is no question that St. George was a brave and principled man and worthy of our admiration and respect. But as legends go, sure, St. Patrick shooed some rats out of Ireland, but here in England there be dragons! A dragon-shaped cigar lighter, made in Sheffield in 1912. Click here to view on our website.